A full-length trailer for the upcoming Super Sentai/Metal Hero crossover project has been posted online! 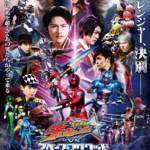 KyuRanger VS Space Squad is currently scheduled for release on August 8 2018! Stay tuned to TokuNation as we keep you up to date on this exciting double-project! 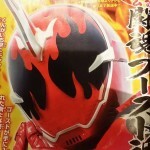 – Shurikenger is set to appear in Ninninger along with returning heroes Ninja Red, Hurricane Red, & Jiraiya. It seems that despite the non-anniversary nature of this show it continues to rely on cameos. – Ghost Tokon Boost Damashii & Benkei Damashii. Tokkon Boost will make it’s debut in Movie Wars Genesis. Benkei will be appearing in upcoming December episodes. – DVD Exclusive Specter Pythagoras Damashii revealed. Apparently the same DVD special as Ghost Ikkyu Damashii. – New villain Javelle will also be making his debut. He has a human form but uses the Ganma Transformation Eyecon to become the Superior Ganma. What do you think of these upcoming developments? Let us know in the thread below!